Your audio system allows you to listen to music from your Bluetooth-compatible phone. 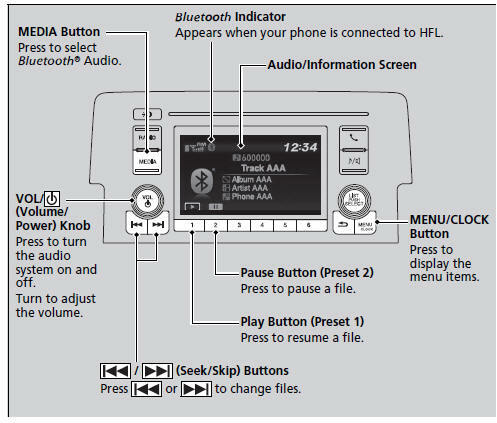 This function is available when the phone is paired and connected to the vehicle’s Bluetooth’ HandsFreeLink’ (HFL) system. Canada: Visit www.handsfreelink.ca, or call 1-888- 528-7876. When there are more than two paired phones in the vehicle, the first paired phone the system finds is automatically connected. In some cases, the name of the artist, album, or track may not appear correctly. Some functions may not be available on some devices.